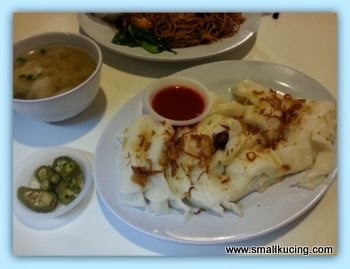 SMALL KUCING: Delicious Sui Kow(Dumplings) at Annie-1 Restaurant, Damansara Uptown. 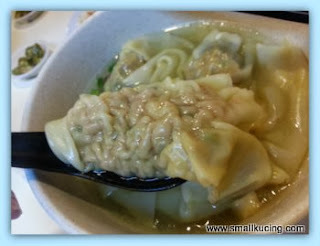 Delicious Sui Kow(Dumplings) at Annie-1 Restaurant, Damansara Uptown. 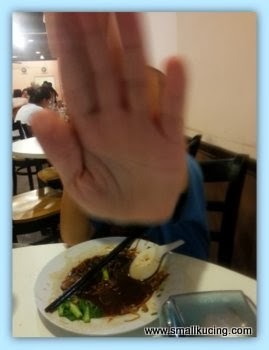 Don't know what to eat....Mamarazzi thought of having Sui Kow(dumpling) . I want noodles pulak. Good for the throat...honey lime drink. 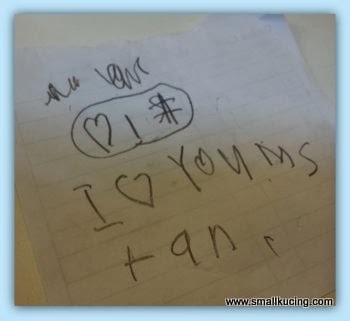 While Waiting for the food, I practice writing love letter to my tuition teacher. A very pretty girl. Never scold me punya. Chee Cheong Fun. Hmm... I wonder if Auntie Claire will love this or not. 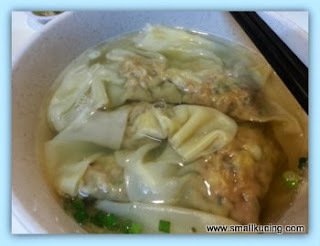 Mamarazzi's bowl of delicious Sui kow(Dumplings). 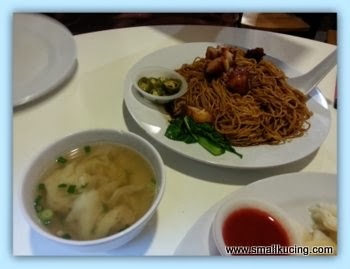 One is not enough leh.....end up ordering one more plate of wantan Mee. Wah, got shown the hand in this post. Like that very serious. The sui kow looks delicious - yum yum I like. 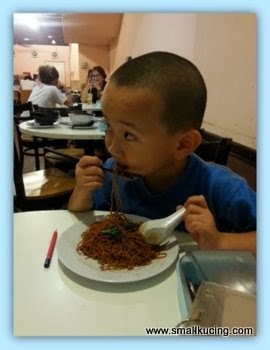 Mamarazzi just ate sui kow only? No noodles? The honey lime drink would be SO good, we have none here! Phil is sucking on a honey lozenge now because he is getting a cold. The food looks fantastic!!! Jaga-jaga you.... he already knows how to write love letter. Be prepared to have future 'menantu' soon. Lol! Very nice especially at this moment now... so early and so hungry!! No lah...cannot beat Sibu kampua and pian sip. Hehehehehehe!!!!! Muahahahahaha!!! 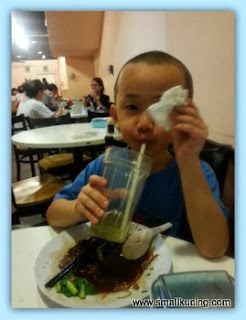 I love Ah Boy's sharp memories. He remembers that Kuku Bird will warn me ahead. I guess he will be stressed with Mamarazzi frequenting the shop now. I still go there once a week. Yes this shop serves very nice and cheap food. There is Auntie Sim next door that also serves the best Olive Fried Rice and Duck Koay Chiap. Very good! I had never eaten the Sui Kow there. I must try it next time. I tend to order almost all the same dishes in circles. The hot white coffee is still my favourite. So far never saw kukubird . . Byvthe time we go there he already become starfish. 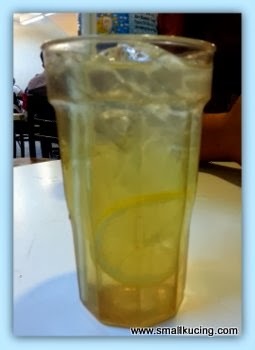 haha, honey lemon drink.. good for the throat, but then sometimes i really wonder what type of honey they use.. probably just sugar or corn syrup with some coloring and flavoring, because you know lah, need to earn that maximum profit with the least cost mah..
No la..corn syrup will be too yellow. Haha~ Don't wanna let u snap photo somomore? Speaking of sui kow, I once saw a travelogue about a country in Eastern Europe and was taken aback when I saw that sui kow has been part of their cuisine. The sui kow they serve are the exact same type that we have here. Interesting, I thought. What else can I say except that such spread of goodies will always be my fav. I remember u blogged about this place not long ago which has quite a good comment, don't you? From Port Dickson to Cemetery and Tj Sepat.